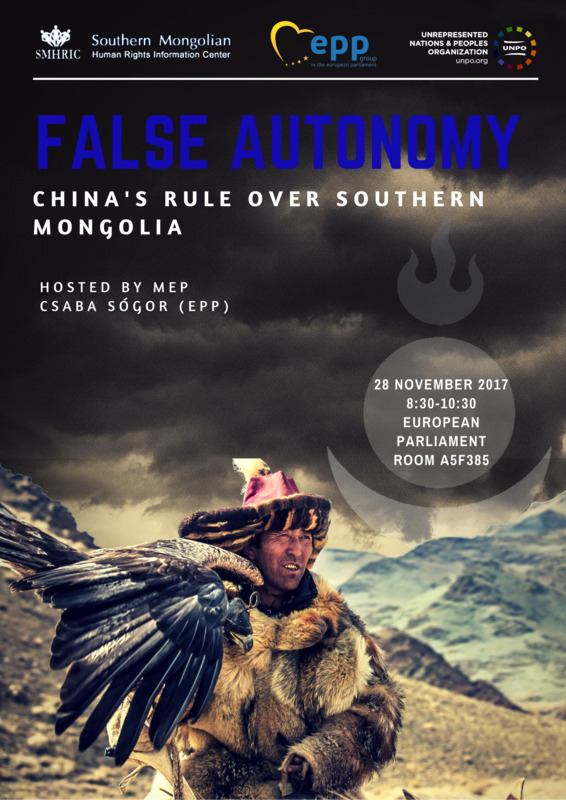 On 28 November 2017, from 8:30 - 10:30 at the European Parliament, Room A5F385, the Unrepresented Nations and Peoples Organisation (UNPO), in collaboration with MEP Csaba Sógor (EPP) and the Southern Mongolian Human Rights Information Center, will host a conference on the rights of minorities in Southern Mongolia. This conference aims to raise European awareness of the oppression of Mongols within China and provide a comprehensive introduction to the human rights abuses they are subject to. Southern Mongolia sits within the borders of the People’s Republic of China, where it is officially named the “Inner Mongolia Autonomous Region” and stretches horizontally along the northern border with Mongolia proper. The region was designated in 1947, and grew to incorporate other contiguous regions with sizable Mongol populations. Recent census data shows that with 24 million people, the majority of the population is Han Chinese. With a population of 4 million, ethnic Mongols are a minority within their own region. Within the Mongol population, there are numerous subgroups who speak Mongol languages, such as the Oirats and the Buryats. As an ethnic, cultural, and linguistic minority within the region, Mongol communities are subject to myriad discriminatory practices by Chinese authorities. The sustained oppression Mongols experience is both geopolitical and ethnic in nature. In these communities, the foremost sources of suffering are internal displacements, as a result of environmental degradation and land-grabbing, as well as ethnic discrimination, particularly regarding their religious and political identities. Mongols are denied political and civil rights in addition to land rights, while suffering widespread human rights violations all the while. Their disenfranchisement is the result of long-term and compounded repression, which leaves them with few viable alternative paths to empowerment. "Overview of Human Rights Conditions of Southern Mongolia"
"Aspiration for Freedom and Self-determination, History of Southern Mongolian Resistance Movements"
"China's Ethnic Policy and the Indigenous Rights of Southern Mongolia"
"China's Environmental Destruction in Southern Mongolia"
"Mongolian Language, Culture and Identity under Chinese Colonization"
Protest: Put Human Rights in China on the ASEM Agenda!